Shimon Cohen: "For every rocket, an entire neighborhood in Gaza needs to be wiped out." "The rocket fire tonight shattered the quiet," he said. "At 2:00 a.m. we awoke to sirens. The rockets fell partly in open areas, and also in a large industrial zone. Today there are no studies in the city, except for one Talmud Torah (hareidi-religious primary school) that received permission from the Home Front Command. The mayor, together with the parents' councils, decided not to take risks." Cohen said that in times like these, many miracles that occur are never reported in the press. "The telephone rings all the time and you always have to calm people down," he explained. "The Nation of Israel trusts in the mercy of G-d, besides all of the necessary physical preparations and Iron Dome. We are all certain that G-d will protect us and we see miracles all the time. Every such rocket is a miracle. Just as it fell in an open space, it could also have fallen on a multi-story building with 80 residents." 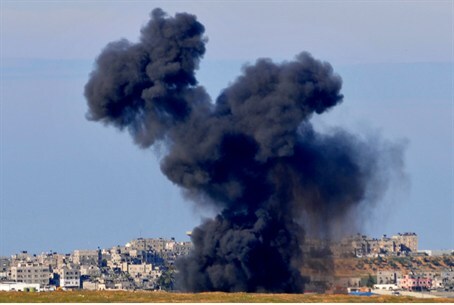 Cohen harbors no illusions that things will calm down unless the IDF bombs Gaza. "Gaza should be ground into a fine dust. There will never be agreements with these wicked people. Signing something with them is like signing on ice. For every rocket, an entire neighborhood in Gaza needs to be wiped out."